Episode 24 Greek & Japanese. Atlur probably comes Atlas, a figure from Greek mythology. 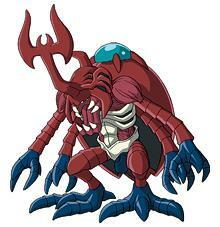 Kabuteri comes from kabutomushi, which means beetle. 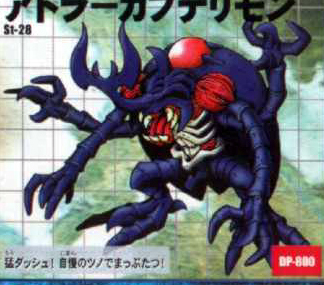 An evolutionary form of Kabuterimon discovered in a tropical area of the Digital World. He's lost some of his flying skill, but the length of his legs and the power of his muscles have increased and his fighting skills have improved. He's a chivalrous Digimon that protects the weak, and he has a strong sense of justice. Tailmon + Win Ratio 40% He uses his extreme power for hand-to-hand fighting! Has the power of "sky"
Dokugumon + Win Ratio 60% He charges the enemy with his wild dash! A super hard horn attack! Has the power of "sky"
If you lose the battle you can choose one face down card from your opponent's Option Slots and send it to the Dark Area. Butterflymon + Win Ratio 40% An iron charge! The earth quakes with his blue lightning!! Once during the battle you may make one of the opponent's Program cards ineffective before it takes effect.